Gerrard Investment Management is a wholly owned subsidiary of Barclays Bank PLC. 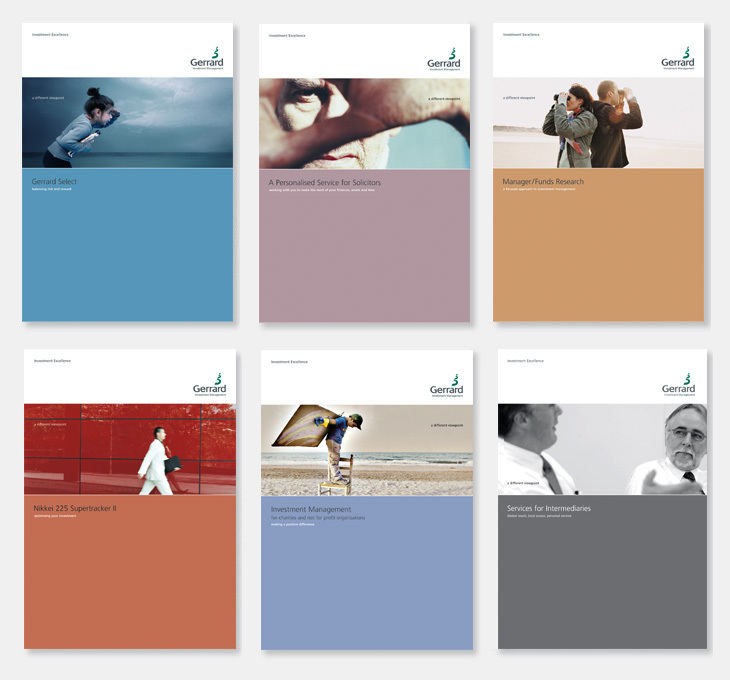 Working with strategic brand consultants Gabriel Research & Management, we were engaged by Gabriel to develop a more modern and relevant image for the company and to consolidate an approach to their client-facing literature. We devised a co-ordinated literature system to cover a wide range of communications that differentiated products and sales tools from the investment services, all held together with a distinctive verbal and visual language. A cohesive range of marketing collateral that created a stronger, fresher and more recognisable brand. As well as devising the hierarchy, we introduced the theme of ‘a different viewpoint’ across all communications, which is also reflected in the style of photography. Based on the 3 divisions in the logotype.